A timeline of the final days of this controversial Queen of England, The Fall of Anne Boleyn recreates those harrowing months in 1536, with firsthand accounts, official documents and records, and court gossip. Though offering opinion here and there, many points of view are expressed from various biographers, and so there is representation from numerous sources. Veteran Tudor readers will not find much fresh information, though the format, being a day-to-day account of events, gives an easy to follow play-by-play of each accused person’s actions, beginning with his origins and introduction to court and the queen. Other key characters are also featured, with a clear understanding of his or her service (or disservice) in the royal court—most notably, Cromwell, who is used by some biographers as the villain, but a tool of Henry VIII to others. The only hard to follow content is in the form of quotes from historical documents written in antiquated English, but the author manages an understandable explanation directly following. 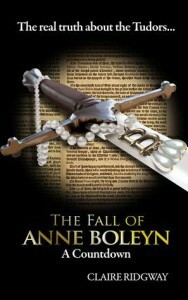 Claire, from The Anne Boleyn Files blog, deftly walks readers through the final days of this fallen queen, giving every possible detail and bringing her dissertation to a satisfying conclusion. This is clearly the product of exhaustive research and a labor of love, and should be a staple among Tudor enthusiasts.